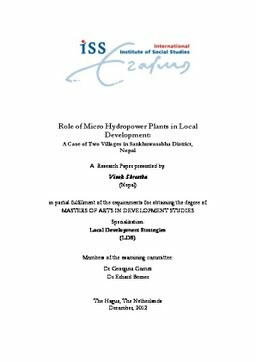 Micro hydropower plants, a form of Appropriate Technology, have become an important source of renewable energy for the rural poor. Electricity from these plants effect the daily life-habits of households and also foster the birth of some new enterprises. This research papers assesses, using ethnographic methodology, how electricity access changes the livelihoods assets of the rural poor. It also explores what kinds of new enterprises have been established since the plants were established.